Most people dream of being fit, in excellent health and fitting in regular workouts to achieve their goals. 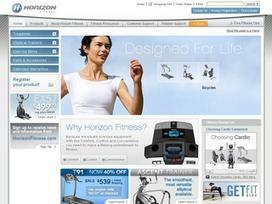 Horizon Fitness helps people make their fitness dreams come true by providing high-quality, affordable home fitness equipment through their online store. What could be better than waking up every morning and just having to go another room to hop on a treadmill rather than squeeze in a quick 30-minute run at the gym in between working an eight hour day and heading home to make dinner and take care of the family? Not only can people achieve their health related goals, they can save time by getting in a workout at home and eliminate the time spent packing gym bags, driving to the gym and waiting for machines if they are working out during peak hours. Additionally, they'll save money in the long term by working out at home and not having expensive gym membership fees. At Horizon Fitness, customers can choose between treadmills, elliptical runners or stationary bicycles which meet high standards in comfort, convenience and control. Walking is a movement that is done daily and many beginning exercisers feel most comfortable doing just that. However weather, time and location prevent many people from taking daily walks. This isn't the case for treadmill owners. They can enjoy a moderate or brisk walk or run at their convenience. For people worried about the noise, treadmills of the 21st century are made to be quieter than ever before. Additionally many come with special features such as built-in speakers, built-in workout plans, cooling fans and some even fold up flat enough to be stored under the bed. Elliptical runners come in many different styles so customers can choose one that is best suited for their needs. They are all designed to help the user get in a full-body workout by utilizing the upper and lower body. Both runners and non-runners can enjoy a great workout as the machine gives the user the feeling of running in a natural motion but without any impact on their joints. After a workout on an elliptical machine, users report feeling energized, stronger and excited for their next workout. Indoor exercise bikes are great for cyclists who want to stay in shape when the weather turns too hot or cold. They also offer a great cardiovascular workout with little impact, an excellent workout choice for beginning exercisers. Exercise bikes also come with various features such as multiple resistance levels which simulate hilly terrain, speakers or preset workouts. Horizon Fitness offers replacement parts for customers to purchase in order to extend the life of their workout machines. Buying home fitness equipment is a large investment and customers want to get the most value for their money. By purchasing items with a coupon code and doing simple maintenance and repairs, customers can save money and get more use from their machines. Share what you think about Horizon Fitness, and your favorite ways to save there!